I collected a dozen churches on my 65-minute walk last Sunday afternoon. I did it for health reasons, really. After a full weekend of reading and writing, I felt like I'd been sitting still so long I was practically growing sprouts, like a potato left in the pantry too long. So, with a mighty heave, I yanked my taproot off the couch and stumbled out into the 45-degree sunshine — a welcome warmup after a winter of polar vortices. Dressed all in black, from jacket to flats, I soaked up the relative heat and set off on a stroll through my Heritage Hill neighborhood and all around the east and southeast parts of downtown Grand Rapids. There were so many church spires piercing the gray-blue sky, and it was Sunday, the Christian day of worship, so I decided to collect as many churches on my walk as I could find in an hour. Unexpectedly, the experience began to feel like an act of worship the longer I walked and the more denominations I found. The sidewalk converted to a sanctuary, and the churches were my vicars, pointing me to their true purpose. Here's a little map-and-key I made showing the churches on my route. 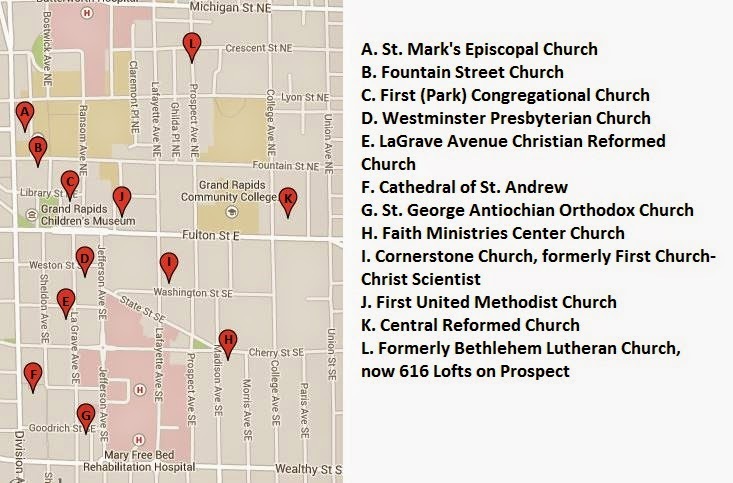 I found myself thinking I could launch a quest to visit these churches' worship services (except the one that's an apartment building now) so I could tell you — and me — what makes them all different. It would be like an adventure in religious journalism. And what a better place to worship than in my own neighborhood? Hmm. I think my bucket list just got a little longer.